Almost identical to the Concept 2 Model D, this Model E has a few different things that might appeal to some. With all the great features and benefits of the Model D, this is still a first rate rowing machine and one of the best in the world. The Concept 2 Model E differs in its seat height primarily. The higher seat gives older people and those with back problems an easier height to get down to. About the same height as a normal dining room chair. The other differences are fairly superficial and it's really the chair height that is going to swing it for you. The monitor arm is fixed as well on this model and while it's longer, we're not sure this difference is worth the extra cash alone. 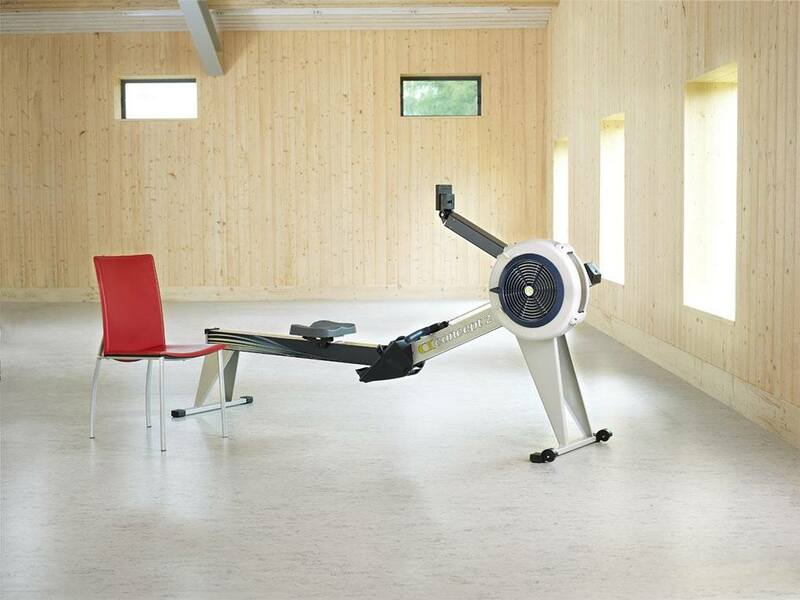 One of the world's top rowing machines. This gives a full body, low-impact workout whether you're a beginner or a champion. Uses air resistance. The resistance level is always 100% user controlled - you pull less or more! Comes with the phenomenal PM5 Concept 2 Computer. Track everything possible and download your results and compare them online with the Concept 2 community. Quite a bit pricier than the Model D. Almost identical, it might be hard to see why this model is more expensive. Air resistance is inherently noisy. Fans of quieter machines might want to look at magnetic or water resistance rowers. Slightly heavier than the Model D due to welded steel construction to support higher seat. 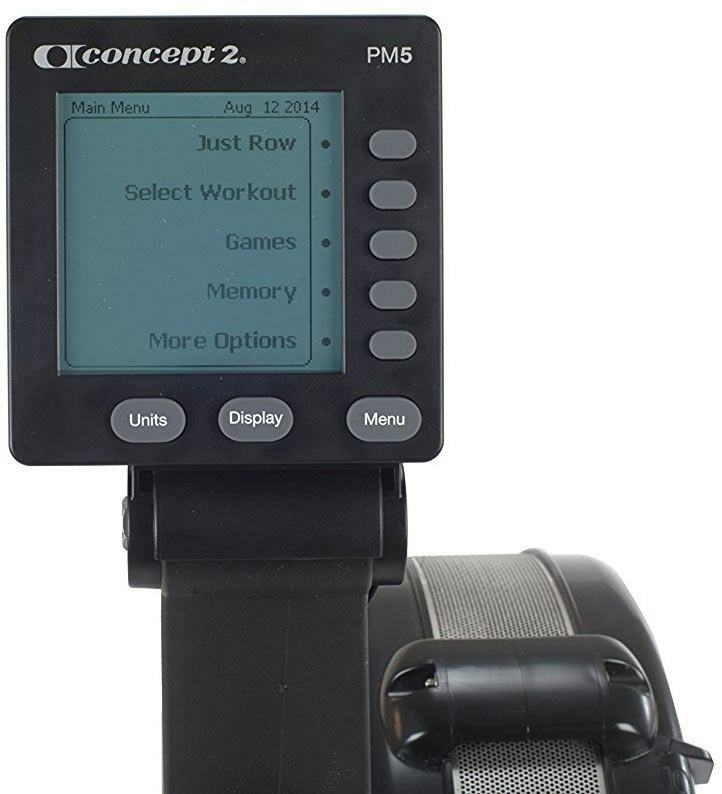 Concept 2 are the true owners of the indoor rowing machine industry. Every single one of their machines is world class and picked by the experts. Started by two Olympians, it's hardly surprising these machines are designed to be the best. Concept 2 is more than a company though, it's a global family of dedicated athletes, club members and home rowers. 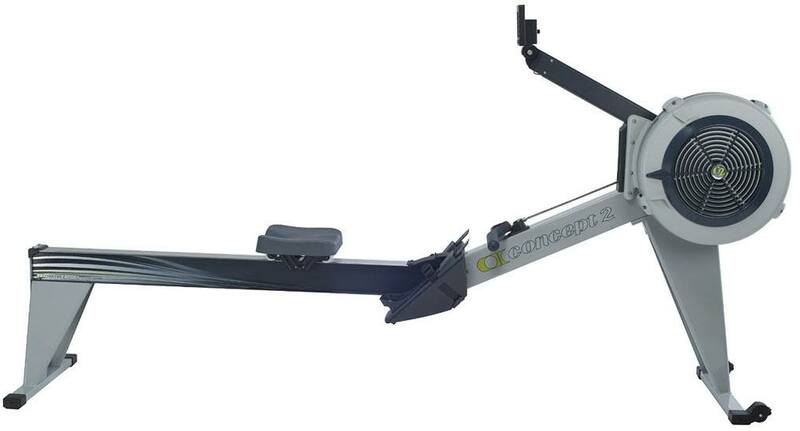 This is the king of rowing machines along with its buddy, the Model D.
An air resistance rowing machine, the Model E is full-length, smooth to use and comes with the phenomenal PM5 computer. The Model E has a higher seat than the Model D. Comparable to the height of an every day chair. Monitor Arm: The PM5 monitor is on a fixed arm that is closer to the user than on the Model D. However, the Model E monitor is in a fixed position. This means it doesn’t fold neatly away like it does on the Model D. With large font sizing available, there’s no reason to move the screen closer for visual purposes. Construction: Made from welded steel as opposed to steel and aluminium, the Model E has been ever so slightly redesigned to take into account the support needed for the higher seat. Chain and Chain Housing: While the D model has steel chain, the Concept 2 Model E has a nickel-plated steel chain and is fully enclosed by the housing. The D model has only partial chain housing. What does this mean for you? Nickel-plating will improve corrosion resistance and give a smoother movement over the years. You also shouldn’t need to oil it at all. Still, it’s not a deal-breaker. Tracks stroke rate, pace, distance, time, split metres, average pace. Connects over Bluetooth to top branded compatible heart rate monitors. Features USB flash port so you can download your workout results. The Concept 2 rowing machines are built to last in professional and club environments. Essentially, they’re designed to withstand seriously hefty use in all sorts of difficult places. In a home or gym environment, the Concept 2s just won’t give up, they won’t break, including the one in this Concept 2 Model E review. Whether you’re 5 foot, 6 foot or 7 foot, the Concept 2 machines can be altered to suit with a full length rail plus extra long rail sold separately as well as adjustable foot straps for the smallest to the biggest feet. The air resistance is user controlled and dependent on how hard you pull. Want to take it easy? Then don’t pull as hard and the resistance will be less! The spiral damper on the side of the flywheel alters how much air is allowed into the flywheel. You can change this easily by hand to a setting that suits your workout and you’ll soon get the hang of it. Concept 2 rowing is a thing. Now you're about to be part of that community and that means that you can upload your times, compare them with others in your age range and gender, and see real results and real progress every time. ​Gyms can be sociable places but they're also expensive and require sitting in traffic to get to after a hard day at work. When you buy your Concept 2 rowing machine, you can workout at home but still be part of that social network of rowers. 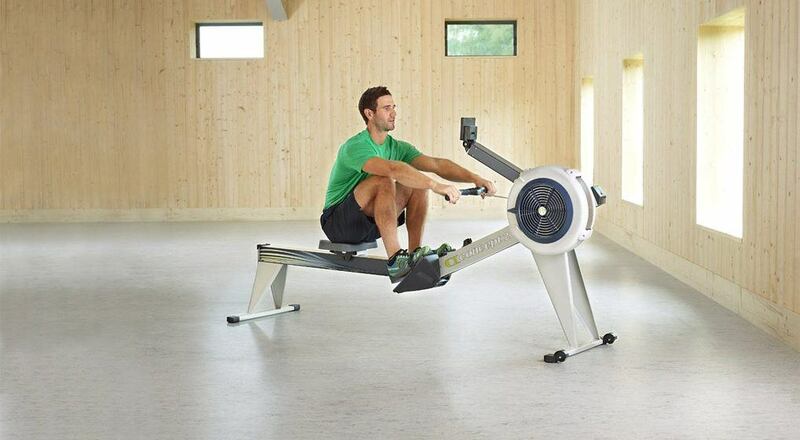 In fact, Concept 2 models are the rowing machines used in competitions and meets! ​Model E: You like having a higher seat, you're not too worried about budget and you don't mind a heavier machine.